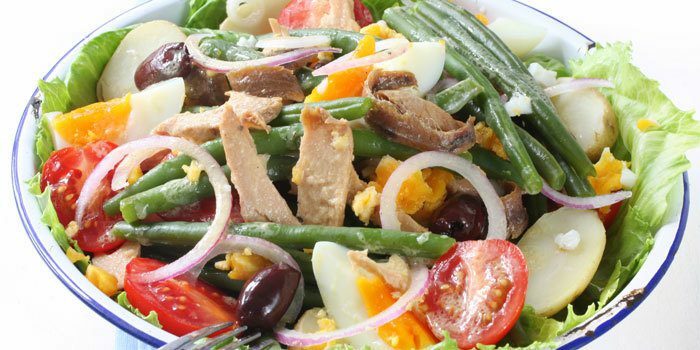 This recipe gives this classic French salad a healthy makeover! It makes a filling lunch or dinner and has only 291 calories per serving. Combine vinegar, lemon juice, mustard, and pepper in a medium mixing bowl; whisk to blend. Slowly add oil, whisking continuously, until blended. Set aside. Evenly arrange lettuce on five serving plates. 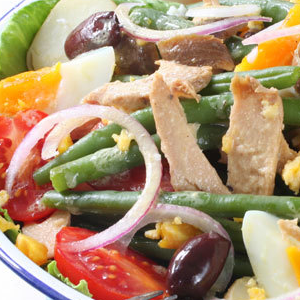 Top with tuna, green beans, potatoes, eggs, tomatoes, onion, and olives. Evenly drizzle dressing over salads.